On Nov. 20, Pope Francis will close the jubilee doors on the right side of the portico at St. Peter's Basilica in Vatican City. One week before that, on Nov. 13, the "holy doors" in the specially-designated churches throughout the world -- including our Cathedral's in Albany -- will ceremoniously be closed. The graces of this extraordinary holy Year of Mercy continue to pour out from the heart of Jesus. Of course, we know His heart is never closed to us, for God never tires of giving and forgiving. Yet, how are we to understand the apparent paradox of closing the very doors that symbolize God's eternal mercy? The answer is simple: It is time for us now to be God's mercy for others -- the mercy we ourselves have received from God. To give mercy, one must first receive mercy. So, this holy year is a time to experience God's mercy like never before. Last April 4, Divine Mercy Sunday, many of you accepted my invitation to join with me as I consecrated our Diocese to the Immaculate Heart of Mary. Mary's "yes" to be the mother of Jesus, our Savior, was the dawn of mercy. Through her heart flows the Divine Mercy. What better way to conclude this Year of Mercy than to give God permission to make our hearts "doors of mercy," consecrating them to the Divine Mercy Himself? We, like Mary, then become witnesses to the power of God's mercy flowing through us -- living doors of mercy. Let's do this together, so that the doors of mercy will never close! Rev. Michael Gaitley, MIC, will be with us once again at the Cathedral of the Immaculate Conception in Albany on Sept. 6, 6 p.m., to help us prepare for diocesan consecration to the Divine Mercy Nov. 13. He will also visit three other venues in the Diocese. 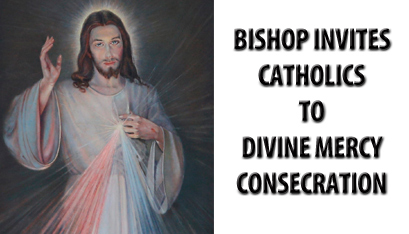 Details are on the diocesan website, www.rcda.org/DivineMercyConsecration. The format of the speaking events, which are free and open to the public, will include Mass, a talk by Father Gaitley and a reception and signing of his book, "33 Days to Merciful Love." Our diocesan-wide, 33-day preparation begins Oct. 11, the feast of Pope St. John XXIII, and culminates with the Divine Mercy Consecration at the Cathedral of the Immaculate Conception on Nov. 13 at 5 p.m. The consecration can also be made at Masses in your parish that day. For information, go to the diocesan website or call Renée Morgiewicz, coordinator for parish services, at (518) 453-6609. On Aug. 15, as we celebrate the solemnity of the assumption of Mary, it will be my special Mass intention that God will touch your heart where you most need the healing power of the Divine Mercy right now. Please pray for me, too.